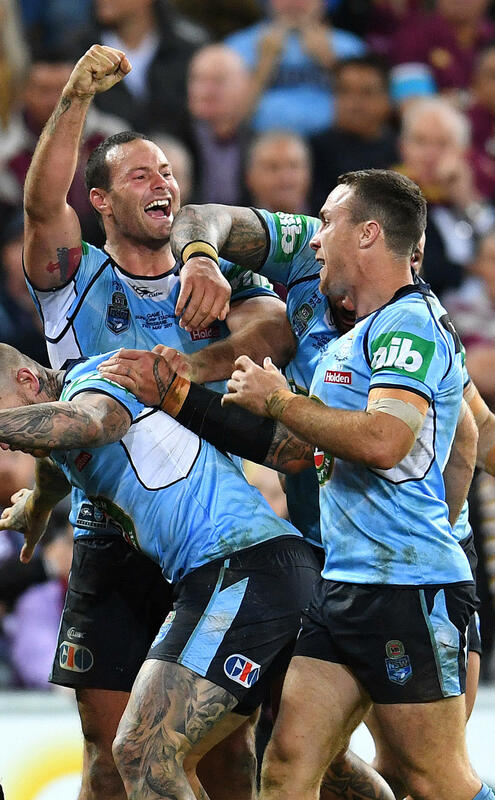 Well here we are, nine rounds in and already the football is starting to distract from the true purpose of the early season – providing context to present fans their preferred NSW Blues line-up for Game 1 of State of Origin. However, it has come to my attention that over the many years of this long and storied tradition, one perspective has been horribly under-represented. So I’ve taken it upon myself to right this wrong by presenting Queensland’s preferred Blues line-up. Now, the title is pretty self-explanatory: this line-up represents the squad that this particular Queensland fan would prefer to see the Maroons take on in Melbourne. While it would be easy to name a team full of nobodies, I’ve limited myself to picking players that have either played Origin before or are currently in the conversation, so there’s at least an element of legitimacy to the team. With the team featuring genuine rep players, benefit to Queensland will have to come from the overall composition and gameplan, much like its real-world equivalent. So what gameplan should these selections revolve around? If there’s one thing Queenslanders love seeing more then anything else from their opposition, it’s one-out hit ups, so that should be promoted, with sweeping back-line plays and second-phase footy to be heavily discouraged. This priority on one-out hit ups should see wingers only getting the ball inside the attacking 20-metre zone so the defence aren’t asked too many questions. Therefore, selections in the back line should prioritise ball runners over ball players. Ball runners tend to accumulate impressive highlights packages which should make these selections more palatable to the southern public while helping to gloss over any deficiencies. Trying to select forwards is a tougher prospect, thanks to the quality the Blues enjoy. So what don’t the Maroons want to see? Well for one thing, big, explosive forwards busting through the line is a big no-no, especially with a selection of ball-running backs coming through with support. So selection will have to drift towards forwards that lay a platform, rather than create opportunities themselves, starving the back-line of the broken play that really showcases their skills. An abundance of defensive workhorses available to NSW also presents the opportunity to oversaturate the backrow with 80-minute toilers, ensuring that effectively utilising the bench remains an issue for the coaching staff. So it’s all structure, structure, structure, and Cameron Smith and his friends eat that kind of thing for breakfast. Perfect. With the guiding principles now in place it’s time to jump into the selections themselves. I was originally considering keeping the incumbent, James Tedesco – seeing as he meets the criteria of a ball runner with a healthy disregard for passing – until I noticed Hopoate still played. If you were to describe Will as a fullback, words like ‘safe’, ‘dependable’ and ‘defensive’ are thrown around – all the polar opposite of ‘dangerous’. Now sure, you might think that Hopoate is capable of passing, but this should be alleviated somewhat by the difference in pace between him and his wingers, meaning that by the time he’s in a position to pass, his outside men should be well downfield. So there you have it, NSW’s Darius Boyd takes out the first spot. Queensland won’t exactly be happy lining up against this guy, but let’s be honest, he’s done just about everything you can to earn a spot and thoroughly deserves selection. Plus, everything going to plan, he won’t see the ball outside of kick returns anyway, taking away the danger he brings in broken play and attacking from mid-field. NSW’s traditional gameplan of wingers rushing up on Greg Inglis and making Boyd look good should also see his impact mitigated. This couldn’t have worked out better – he’s a ball runner, allergic to passing, and the current incumbent! Sure, he’s got a broken foot, but in the time-honoured Origin tradition, I’ll give him every opportunity to prove his fitness. With favourite picks Jaryd Hayne and Michael Jennings out of the equation – due to injury and commitment to Tonga, respectively – it was time to take the search a bit left of field (well, technically right of field). After losing his spot to Addo-Carr it became quickly apparent that Ferguson’s offloads were far too important to Queensland’s gameplan to drop him out of the squad entirely and the opening at left centre seemed a perfect fit. Picking a player out of position and on the opposite side of the field may seem doubtful but is entirely plausible when referring to Blues selections. After narrowly missing out on the fullback role, Tedesco’s perfect fit into the all-running, no-passing backline ethos made him too good a proposition to pass up and subsequently he earns himself a spot on the wing. The dangerous abilities that saw him miss out on the fullback role should be well contained on the wing, where his role will be confined to returning kicks into set defensive lines and being bundled out of touch five metres out from the Maroons’ goalline. With first-choice James Maloney no longer giving the amount of penalties that once made him so attractive to Queensland supporters, it seemed fitting to give this spot to the guy who replaced him at the Sharks, with the difference between their respective teams’ performances since only aiding his case. 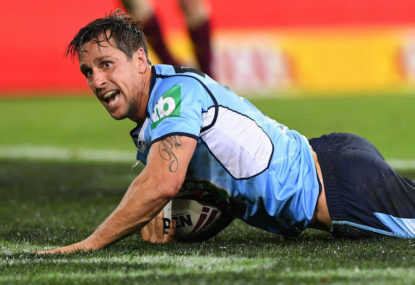 Sure, he has the potential to be dangerous, but in a forward-heavy gameplan, Moylan should only receive the ball on the last, with limited opportunities or not at all if the Blues find themselves on the back foot, as is the NSW way. Let’s be honest, he was a lock the moment this team was envisioned. He might be out for the season but I don’t see how that should have any effect on his impact in the origin arena and at least he’ll have an excuse once fans start accusing him of going missing. Do I think that Woods is a bad player? Not at all. In fact, he’s pulled out some great performances for the men in blue. What he does is lay an excellent platform for the team to play off. However, we saw in last year’s series that once Andrew Fifita stopped busting through the line, the Blues weren’t able to capitalise despite the platform their props provided. Field position doesn’t mean much if you can’t do anything with it and a good platform is much easier to handle for the Maroons than a raging prop busting right through the middle. So while Woods’ name might not put a smile on Queensland’s faces, it certainly won’t put fear in their eyes. 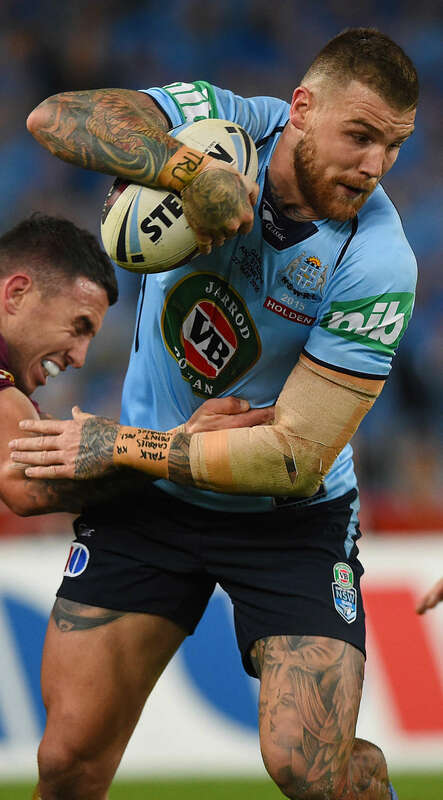 He does have a handy offload, but this should be mediated somewhat by his equally handy ability to give away a much-needed penalty when Queensland get on a roll. As much as I would have loved to, it didn’t seem fair to pick Robbie Farah from reserve grade, no matter how good he was at denying the halves of ball at important times in the game. With incumbent Nathan Peats ruled out with injury, the spot comes down to a toss-up between Cameron McInnes and Damien Cook. I had to deem Cook’s disposition for dangerous dummy-half scoots far too much of a liability for Queensland in a game featuring so much fatigue in the middle. And so the position falls to McInnes to make his own in the hopes that he will be able to channel Peats’ work last series in completely adhering to the gameplan and not getting any silly ideas about playing what’s in front of him. I like Klemmer, in fact I’d like him to be a Queenslander. But, much like Woods, the Marrons have had a lot of practice lining up against him. He runs hard, tackles hard but he won’t break the game open and as long as no one else in the forwards does either, Queensland should be able to manage his impact. As mentioned in the opening paragraphs, backrow selections will revolve around workhorses and there’s not many better than Josh Jackson. Capable of playing long minutes and invaluable in defence, Jackson will make it hard for the coach to justify giving him a rest while not putting too much pressure on the Maroons’ defensive line. Another player capable of playing big minutes, Jack has certainly had enough noise around him to justify a debut call-up. While his defence is sure to make things difficult for Queensland through the middle, that same defensive workload should dent his impact in attack. Doesn’t really fit the role of a defensive workhorse or a big-minute player, he’s mainly picked to give the Queensland forwards a softer target to aim at after the last two selections. Purely named on the bench to emulate one of Queensland’s favourite selection anomalies from south of the border: naming the captain on the bench! The fact that he can play big minutes and only complicates the use of the bench are of course big advantages too. No legitimate Origin bench would be complete without a replacement prop and Tamou fits the criteria well. The Maroons have plenty of experience marking up against him and, like Woods, he’s good for a vital penalty just when you need it. Never received enough credit for helping Queensland retain the shield last series, and his discipline and decision making when under pressure are certain to be key factors in the Maroons’ battle plans once again. I rate Apisai, so it is with a heavy heart that I nominate him for the utility role. I’m sure he could do some damage coming on against tired bodies, but as is the case with all Manly players given the utility role for their state, he will only play for six to eight minutes, and only after the result is a foregone conclusion.